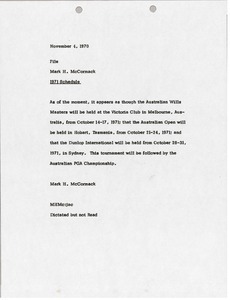 Australia - McCormack notes that the dates of the Australian Wills Masters and the Australian Open, as well as the Dunlop International and the Australian PGA Championship. 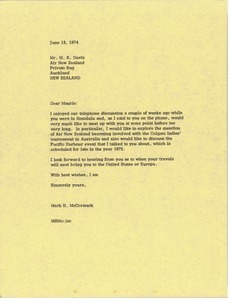 Australia - Concerning the date of the Australian Masters next year and an interest in McCormack commentating for it. 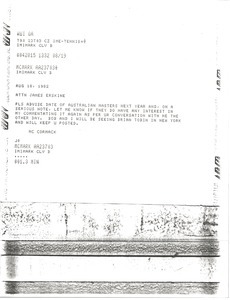 Australia - McCormack writes regarding Taylor's refusal of the 1981 Mexican Open television rights and interest in the 1982 Mexican Open Golf Championship rights. 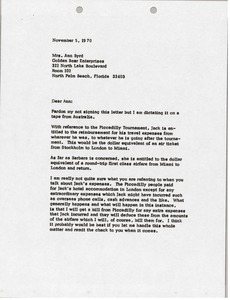 Australia - McCormack notes that Jack Nicklaus is entitled to travel reimbursement for travel expenses to and from the Piccadilly Tournament, but beyond that, is unsure what Byrd referred to in her previous letter. 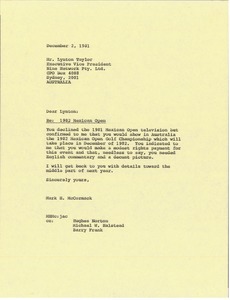 Australia - Concerning the Clare Higson - Precision Golf Forgings. 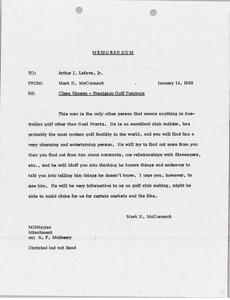 McCormack explains that Higson is the only other person that means anything in Austrian golf, other than Nowl Morris. 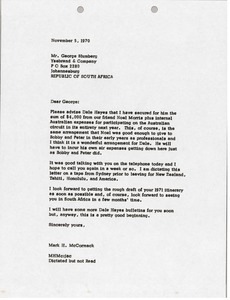 Australia - Concerning the itinerary for Australian golf tournaments in 1971 and which of McCormack's players will be playing in what tournament. 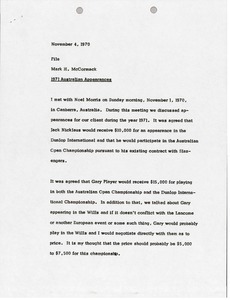 Australia - Concerning the idea of an Australian Grand Slam of Golf. 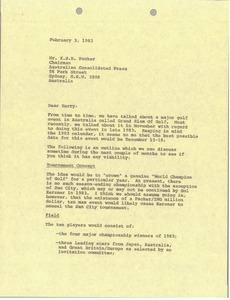 Tournament concept, field, fromat, and purse are discussed. Australia - Suggesting a meeting to discuss the possibility of Air New Zealand becoming involved in the Colgate ladies' tournament in Australis as well as a Pacific Harbour event. 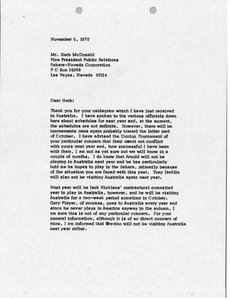 Australia - McCormack would like Blumberg to inform Dale Hayes that he has secured money from Noel Morris, plus internal Australian expenses for participating on the Australian circuit in its entirety next year.